If you are interested in the Northern Argentina Birding Tour, come and join us at Kaiyote Tours! 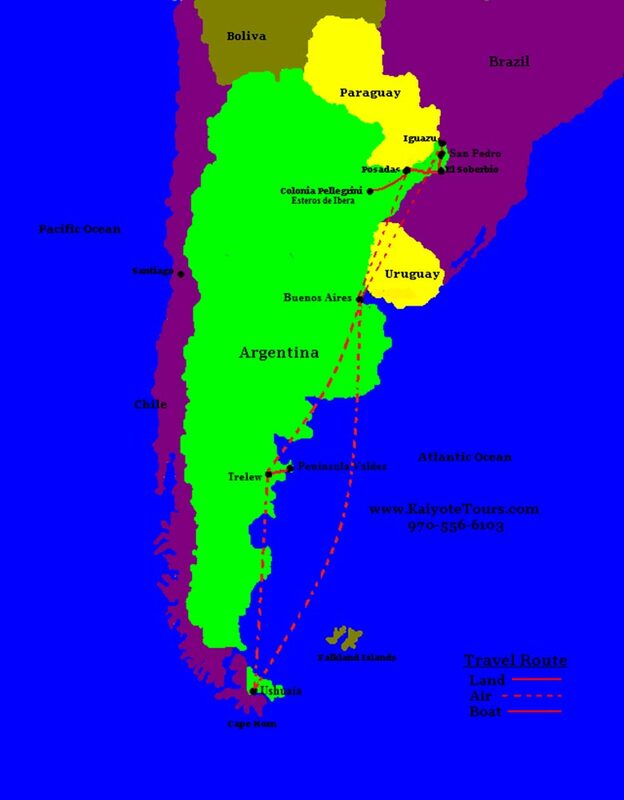 Our trip to Northern Argentina is one of our most mellow and relaxing trips and on the next trip we will visit Buenos Aires, Uruguay, Misiones province of Argentina, Iguazu Falls, Brazil and Paraguay. On this tour we don’t cover a lot of ground, but the places we visit are very dense with wildlife and beauty. This trip focuses on birds, insects and wildlife. Argentina is a wonderful country to visit. Iguazu Falls and the surrounding jungle is an amazing paradise for birds, wildlife, butterflies and flowering plants. The name Argentina means "made of silver" in Italian. Spanish explorers arrived in the early 1500's and Buenos Aires was initially founded in 1536 by Pedro de Mendoza. Argentina has a population of 36.2 million and the capital city of Buenos Aires with 15.6 million in the metro area is nearly half of the total population. Buenos Aires means “good air” or “fair winds” in Spanish. Argentina is a country of extreme and abundant diversity. Argentina's highest mountain is Aconcagua 22,831 feet and is the highest peak in the western hemisphere. The lowest point is Laguna del Carbón at -344 feet and is the lowest point in the western hemispheres. The north–south distance is 2,300 miles and the climate varies greatly; ranging from subtropical in the north to polar in the south. The weather is affected by the extreme changes in elevation, longitude and the warm Brazil ocean current and the cold Falklands current. Iguazu Falls includes 275 individual falls, making it the largest waterfall grouping in the world. It is a must see for everyone. Argentina belongs to one of the largest ecosystems in the world with the greatest bio-diversity. Here are the stats: 15 continental life zones, 3 oceanic life zones including the Antarctic region, 9,372 vascular plant species, 1,052 bird species, 375 mammal species, 338 reptile species and 162 amphibian species. Argentina has 30 national parks helping to protect and preserve these habits and ecosystems for all life. Buenos Aires is famous for the Tango, a musical genre and accompanying dance. The golden age of the Tango was from 1930 to mid-1950s and still today it is one of Argentina's international cultural symbols. Our last evening event in Buenos Aires will be to visit a Tango show. Visas needed for this trip: Argentina (free) obtain at airport. Paraguay (from Iguazu, free to enter Ciudad del Este only). Brazil ($70 eVisa) obtain in advance on-line. Uruguay (free) obtain upon entry. The visits to Brazil and Paraguay are activity options and are not required if you do not wish to visit those countries. We will be staying close to the Reserva Ecológica Costanera Sur, which is a large nature reserve for birding and walking along the water front. Over 200 different species of birds have been seen on the park. We will have a walking tour of the historic harbor and plazas. The hotel has a roof top swimming pool for viewing birds and city views. Buenos Aires is located along a large inlet from the Atlantic Ocean called the Rio de La Plata and just across the water is Uruguay. It is a 1-hour ferry ride to the city of Colonia de Sacramento in Uruguay and an easy 30-minute drive to Cabañas Maria Maria in the village Conchillas. This beautiful property in the countryside has a lake, pool and many gardens for birding. Besides birding there are options for horse-back riding and hiking. We will be taking the ferry back to Buenos Aires and staying in the city at a great location near the botanical gardens and other numerous parks. Buenos Aires is a city full of parks and natural areas which are great for birding and walking. From Buenos Aires it is a 2-hour flight to Iguazu Falls. We will have 4 nights and 3 full days to visit this extraordinary area. We will be staying an at eco-lodge at the edge of the park where there are many trips and opportunities for birding and viewing wildlife. All day will be spent walking and hiking the trails and visiting the numerous waterfalls within Iguazu National Park. The butterflies here are amazing and there are monkeys, critters and birds galore! The Iguazu area is large with a lot to see and there will be another of walking and hiking the trails and visiting the numerous waterfalls within Iguazu National Park. The place of lodging has walking paths and a nearby animal reserve for viewing flora and fauna. The hotel itself is a great location for nature; there are nice gardens, a swimming pool and recreation area. The last day in the Iguazu area and we will be taking a day trip to Brazil and Paraguay. This day trip is optional and you are welcome to spend the day in Argentina at Iguazu. You will need a visa to enter Brazil. It is a 2-hour flight back to Buenos Aires and we will be staying in the city close to the Reserva Ecológica Costanera Sur, which is a large nature reserve for birding and walking along the waterfront with nice beaches. The hotel has a roof top swimming pool with great views of the reserve and waterfront along Puerto Madero. In the evening we will have dinner and see a tango show.